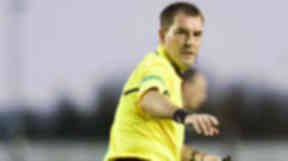 Referee Dougie McDonald is leaving his post as a Category 1 official and issued a statement through the Press Association warning that Scottish football had to rethink its attitude towards officials. Dougie McDonald's statement, released on November 28. It is with regret that I have decided, with immediate effect, to retire from my role as a Category 1 referee. My Category 1 colleagues decided rightly to withdraw their services from matches this weekend in response to the outrageous way they have been treated by sections within Scottish football and, in my opinion, the lack of support they have received from the SFA General Purposes Committee in recent years. However, their united stand, and the position of strength they have established this weekend, has been clouded by one issue, namely the aftermath of the Dundee United v Celtic match on 17 October. I apologised for my role in that and wanted my previously unblemished 29 year career to move on. Now is the time for all of Scottish football to move on. My decision will therefore remove that issue from the debate and ensure that the next day of action – which, in my opinion, will undoubtedly come if the football community does not have a massive change of heart – will result in media coverage being concentrated on those who engage in referee bashing and those who condone it. It is also important to make clear that just as this issue is not about Dougie McDonald alone, nor is it about Celtic Football Club alone. I have read comments this week from Craig Brown, whom I admire hugely in the way he deals with referees, saying his club doesn’t engage in questioning referees publicly. They maybe haven’t under his reign, but the previous manager did and I don’t recall the club apologising or dealing with their employee. The truth is, since I became a class one referee, managers or players – and sometimes directors – at almost every club, at one time or another, have been guilty of such behaviour. The only difference being the degree and tenor of the criticism and the inferences from it. The constant has been the unwillingness of the SFA General Purposes Committee to deal with it. I suggest they check the meaning of phrases such as "wasn't impartial" used by Aiden McGeady and “conspires to” used by Peter Houston and consider whether we want those used in Scottish football. If things are to change for the better, clubs need to ensure their employees leave referees to do their job and the SFA has to deal strongly with those clubs who find it impossible to focus on the football. The current leniency of the SFA and the system of paltry fines and ineffective bans are proven to have zero impact. If the clubs are genuinely concerned about relationships with referees – and hopefully they are after this momentous weekend - and they want to make changes, they should have no fear in signing up to a disciplinary system that will see more stringent penalties and ones that have more direct impact on clubs, rather than their errant employees. If, on the other hand, they wish simply to pay lip service to referees then the status quo should prevail. But make no mistake, in my opinion, the withdrawal of referees’ availability will happen again and perhaps for a longer period than one weekend. The intolerable media pressure that has seen television news crews at my place of work and journalists and photographers at my front door, together with the appalling treatment of Hugh Dallas by the SFA, has convinced me that I no longer wish to be a part of Scottish football. This statement is my last comment on the matter and on Scottish football. I ask for peace, privacy and respect for my family and I implore those who have the authority to make a difference to do so now and allow my good friends and colleagues to once again enjoy refereeing the game they love.